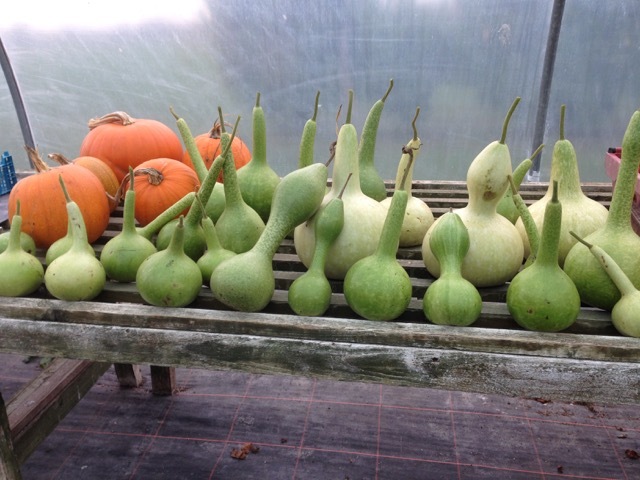 This year we grew these interesting shaped gourds for the first time. An annual, they originate from Africa and some form of gourd was grown and added to soups, pottage and pies in medieval and Tudor times. They require a warm sunny spot and the walled garden was perfect for that despite the summer we have had. Gourds require a lot of space to grow and the space beside the gardener’s shelter was ideal. Given that pumpkins were not introduced into Europe until Columbus bought back seeds in the 15th Century, I am speculating that the pumpkin Neckham was describing is a gourd just like ours!